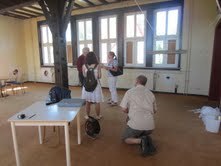 On 1 August, the American Los Angeles Times journalist and book author, Annie Jacobsen, came to Camp King Oberursel to do research for her forthcoming book. Her previous book, Area 51: An Uncensored History of America’s Top Secret Military Base , was on the New York Times Best Seller list for 14 weeks. 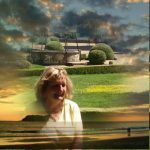 Initially, while doing research via the internet and other sources, she came upon my blog posts about Camp King and found what she was looking for – Mister Camp King a.k.a. Manfred Kopp, our local Camp King Historian. It only took a few more mails to set up our meeting in Oberursel. When she first arrived at Camp King, she took us out to lunch at the local pizzeria, followed by a tour through Camp King. Mr. Kopp also had the keys for the Mountain Lodge, so we got to take a look inside. Yes, something is actually being done, I saw paint buckets in the corner! The Taunus Zeitung had sent its reporter, Ms. Takim, and a photographer as well. After the interview with the paper, we then proceeded to head on to Schloss Kransberg (a 30-minute drive to Usingen). 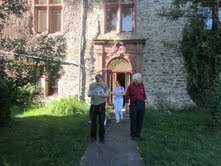 Due to Annie’s arrival, she had obtained permission to visit the castle from the current owners. 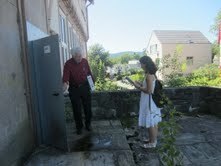 Jan Herrmanns, the building and grounds manager, gave us a tour. It was interesting to be standing in Göring’s office. More about that in another post. Note: The Taunus Zeitung published the article about Annie’s visit today, see Auf der Suche nach Geheimem.